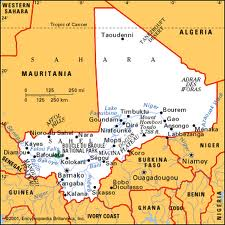 French defense ministry officials have said that they are planning to make a withdrawal from Mali by April. Since January 11, when the French military began to bomb and launch a ground invasion into this resource-rich country, the government in Paris has declared that its operations are limited and they were only there as a precursor to the intervention of a regional force from the Economic Community of West African States (ECOWAS). Although several thousand troops from various African states including Chad, Nigeria as well as the national army of Mali have entered the battle alongside the French, the former colonial power also made an appeal for the United Nations to take over the operations which are really designed to secure the resources of Mali for the benefit of western industrialized states. Earlier UN Secretary General Ban Ki-moon had publicly stated that direct intervention by the international body would jeopardize its personnel carrying out humanitarian work inside the country and throughout the region. On February 10, in the northern city of Gao, armed combatants opened fire on Malian military forces in the downtown area. Soon French helicopters entered the fray firing into areas in the center of the city in a battle that lasted well into the evening. The fighters involved in this round of clashes were thought to be from the Movement for Oneness and Jihad in West Africa (MUJWA). Since the French were reported to have entered Gao on January 26, MUJAO has been firing on their military units from outside the city. French Gen. Bernard Barera claimed that the MUJWA combatants utilized small boats to cross the Niger River into Gao. On February 9 a bomb was detonated at a checkpoint near the entrance of the city. Just two days before on February 8, a reported suicide bomber driving a motorcycle detonated explosives at the same entrance to Gao. During the fighting on February 10, people remained in their homes to avoid injury and no civilian casualties have been officially acknowledged. During the clashes on February 10, a police station was taken over by the MUJWA guerrillas. The next day, February 11, French combat helicopters bombed the station in an effort to drive out the fighters. French military spokesman have also claimed that the Islamist groups have fled into the northeast mountainous region of Adrar des Ifoghas. Fighter jets have been carrying out bombing operations under the guise of destroying the bases of the fighters and disrupting their supply lines in the area. The overall security situation in Gao has been deteriorating for several weeks. A number of Malian soldiers have been reported killed by landmine explosions on the main road leading further north. Even France has admitted that there are units of Islamist fighters in the areas between the major towns who are engaging them in mobile operations. “We are in a dangerous zone…we can’t be everywhere,” a French officer told journalists. Other fighting units have been seen in Batel, some 15 miles outside of Gao. France is continuing to deploy additional troops into Mali, said to now number 4,000. Meanwhile in the capital of Bamako, there were clashes between rival elements within the Malian military. The guard regiment, known as the “red berets,” which was loyal to ousted President Amadou Toumani Toure, overthrown in a coup last March 22, have refused to be sent to the frontline alongside the French in the north. Troops who backed the military coup led by Capt. AmadouSanogo, the Pentagon-trained officer, attacked the barracks occupied by the guard regiment and members of their families on February 8. Reports indicate that as many as three people were killed and six others were wounded. One of the major reports that emanated from the north of Mali claimed that the Ahmed Baba Institute, which houses thousands of manuscripts from the ancient kingdom founded during the 13th century, had been burned to the ground by retreating “al-Qaeda linked rebels”. This story was credited to the former mayor of Timbuktu, Halle OusmaneCisse, an allegation which inflamed passions across Mali, Africa and the world. Even Sky News reporter Alex Crawford reported from inside the library illustrating that the institution was relatively unharmed. The Institute was funded by the African Renaissance Fund based in South Africa as part of a continental-wide effort to preserve and study the ancient civilizations which flourished prior to the advent of European slavery and colonialism. These developments in Mali are indicative of the role of imperialist propaganda and psychological warfare designed to build public support for military invasions and occupations. Similar scenarios have been carried out in relationship to interventions in Afghanistan, Iraq, Libya and Syria. Consequently, as in other military adventures by the imperialist states and their allies, it is necessary to expose the lies that are being spread through the corporate media. Anti-war and anti-imperialist forces within Africa and the capitalist states must organize to oppose military interventions throughout the continent and in other parts of the world.